The West Virginia Disc Golf Tour Finale! Players pack will consist of a custom stamped disc, JCDC towel, and multiple items from local businesses. Will update with additions! *Because the player pack includes a T-shirt -- those who have registered and paid, or those who have completed the cashless registration before 9/15/18 can be guaranteed a shirt. Sizes cannot be guaranteed available without registration information by 9/15/18. All players will play two rounds of 24 holes. Open / Advanced will play 1 round from short tees and 1 from long tees. All other divisions will play 2 rounds from short tees. We will be selling lunch specials for $5 a piece. Pulled pork sandwich with sides and drink OR two hotdogs with sides and drink. Snacks and drinks will be sold separately as well. There will be multiple raffles / country store items to enter to win. We will be selling tickets for the raffle or you can opt to donate discs for tickets. All money raised goes to the Jackson County Developmental Center to support people with disabilities. All discs donated will go towards growing the sport with the Special Olympic Athletes in WV. Registration closes on October 1, 2018 at 11:00 p.m (EST). This is the sixth and final event of the West Virginia Tour. 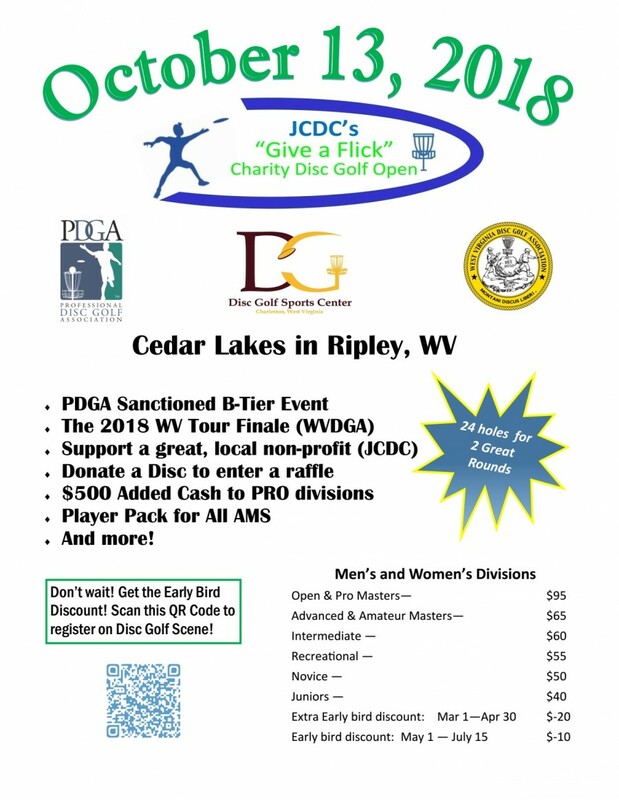 Each player must be a WVDGA Member to accumulate points for the series. Pay an additional $4 with registration for a chance to ace and win up to $10,000. Everyone is welcome and encouraged to attend!! Jackson County Developmental Center (JCDC) is responsible for all refunds/cancellations. Refunds will not be given for inclement weather.